A PC users biggest problem is the security of his computer. To avoid the threats that can be found on Internet, the best thing is to perform regular maintenance, and eliminate the possible threats. Thus, one of the things we have to keep under close surveillance is our browser. 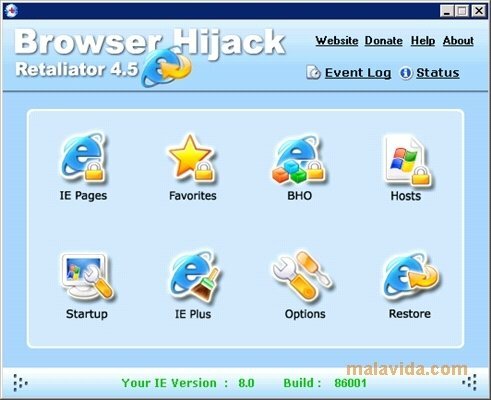 To eliminate the security risks when we use Internet Explorer we have Browser Hijack Retaliator, also known as BHR. 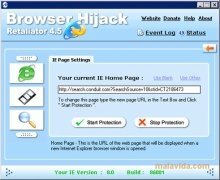 This application has quite a few tools that will help us protect against hijack attemps against our browser. - Protection for the browsers starting page and your favorite sites. 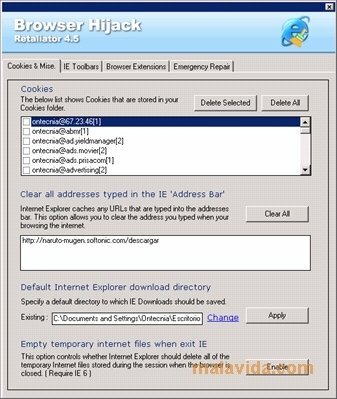 - Browser Restore (only for Internet Explorer 5 and 6). - And many other configuration options. 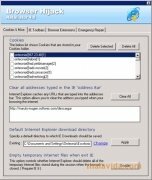 Eliminate any possible threats against your Internet Explorer browser and recovery your surfing speed, with Browser Hijack Retaliator. It doesn't work on Windows Vista or later OS.